Hungry and looking for a quick amazing bite? 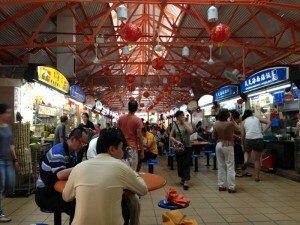 Hawker Centres are just the place you are looking for. Singapore used to have a lot of food carts on the streets that were ran by immigrants from China, Malaysia and India. A few years back, the government took all of them from the streets and put them spread across the island in food courts. These food courts have a clean water and sewage so this initiative enable clean street food for the community and visitors. And above all, it is ridiculously cheap. For 10SGD you will eat like a king! The Hawer Centres are everywhere from fancy Raffles Centre to suburbs. It all depends where you are and how 'local' you can bear to go. Be prepared to share a table, use plastic plates and brave the heat with NO air conditioning or napkins. They are maid of a combination of food specialists. I say that because these people have been cooking one type of food or some times one dish for their whole lives. They cook each dish to perfection or at least a lot of them do. The most famous dish in Singapore: Chicken Rice. 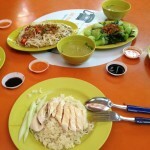 Tian Tian for example is No1 Chicken Rice but Wee Nam Kee is pretty amazing too and they have several outlets. Other very famous dishes that are not to be missed are: murtabak, roti prata, Chili Crab, Laksa, Sweet n Sour pork and Satay. Gluttons Bay: anything is good here. It was chosen by food critics of Makansutra guide. The diference here is that you eat by the Marina Bay. Wee Nam Kee is supposed to have one of the best chicken rice. Food Republic @313 Somerset. Have handmade noodles done by this guy. So thick and delicious. Maxwell Food Court: Tian Tian!!!! 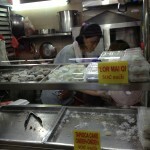 And go at lunch time to catch the lady that makes Malay sweets called Ondeh Ondeh! Little coconut gummy sweets to die for! Bukit Batok Food Court: our local 🙂 Not to be missed. 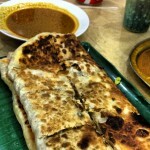 Prata and Murtabak are amazing here and a mst stop for our guests.